My Miss B turned 5 on Sunday. It’s been a big year for her already – she has started school and loves it. We decided to have a party in a local park and invite her whole class, which seemed like a great idea until the week of the party. Solid rain, with the forecast for the day of the party most optimistically described as “showers”. There was much frantic checking of the weather prediction sites, desperately trying to find one that promised sunshine. There was also much late night shopping while sadly noting the onset of a head cold and cranky throat. 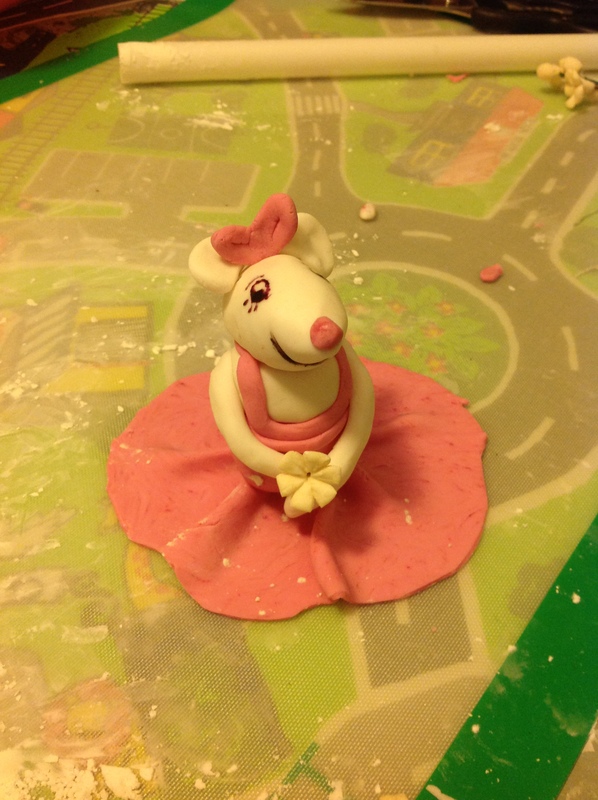 The birthday girl had requested an Angelina Ballerina cake and I did entertain thoughts of buying a plastic Angelina to just stick on the top but apparently they don’t make them – bastards! So I turned to my modelling icing. Which turned out to be 2 years out of date. Whoops. Luckily I had some ready made fondant so I just decided to make a soft Angelina. I’m sure ballerina mice are meant to be a bit squishy, right? And here she is, in all her stuck-together-with-skewers, poorly painted glory. I was so relieved it looked vaguely like a mouse, but also so tired, that I sent out a picture on twitter along the lines of “For the love of God, can someone please tell me they can see who this is meant to be“. Luckily lots of lovely tweeps promptly messaged back saying “Angelina!”. I breathed a sigh of relief and went to bed. The rest of the cake construction went relatively smoothly, although my runners arms got tired from kneading colour into the icing and I gave up before I made it to the stage of uniform colour. I also realised that I’m a bit crap at applying fondant icing. Fortunately I realised at the same time that I didn’t care. B: Is it chocolate cake?! B: But I wanted an Angelina cake! Me: It is an Angelina cake. Angelina is on the top. B: But it was meant to be Angelina flavoured! Me: (thinking WTF?) Um…what does an Angelina flavoured cake taste like? Me: Ah. Well, sorry about that. Who knew mice tasted like strawberries? I also had a request at the party to eat Angelina’s head. 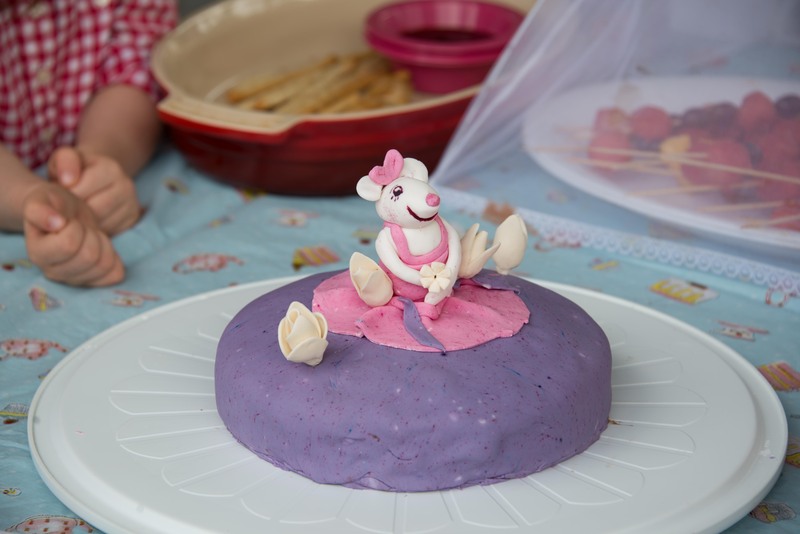 I have to point out that Angelina’s head had already come off when I cut the cake, so she wasn’t asking to decapitate Angelina, but I was concerned about her request to eat what was basically a painted blob of icing (non-toxic colour, obviously!). However, she was an extremely persuasive and charming 5 year old and I eventually gave in. She was delighted to find it was an entirely icing head and quickly came back for the rest of her body. I drew the line at that though – an entire icing mouse is just not healthy. And I almost forgot the most important parts – a) it didn’t rain; b) Miss B had a fabulous day and c) I met a whole new group of fabulous children and parents. Life is pretty damn good. Angelina looks amazing! And yes, who would’ve thought the cake is supposed to be Angelina-flavoured too!